If you ask anyone living in Berlin what the typical food of Berlin is it is very likely that you will get one of the two following answers: Currywurst or Döner Kebab. As the German cuisine is widely popular for its different kind of sausages it doesn’t come as a shock that a sausage is one of the most popular foods. In addition, supposedly the recipe of the Currywurst goes back to a lady by the name of Herta Heuwer who lived in Berlin. Just on a little sidenote Berlin and Hamburg are in somewhat of a tussle about where the currywurst was originally invented. But it might surprise you to find out that a dish originally from Turkey like the Döner Kebab is one of the most popular foods in Berlin, and maybe even in all of Germany. As a matter of fact the German capital alone counts over 1300 Dönerbuden and some refer to it as the “Döner capital.” Particularly, the district of Kreuzberg is known for its high Turkish population and great döner. 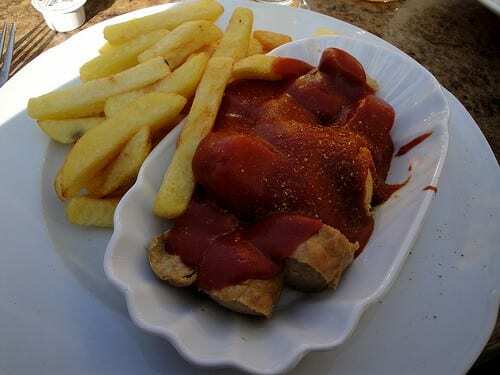 Traditionally, the currywurst is a chopped pork sausage with curry-seasoned ketchup. It often gets served with fries or bread. 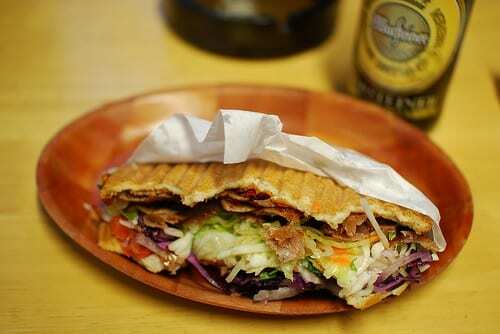 The döner is carved meat from a rotating grill, tomatoes, red cabbage, onions and lettuce in pita bread served with a combination of yoghurt garlic sauce and a spicy chili pepper sauce. Though, the döner itself might not come from the Germans directly and has existed in Turkey for over 150 years, the Germans can pride themselves on the convenience factor adding the bread which brought the döner off the plates on the streets as take-away. However, the pride in the currywurst as a Berlin invention goes deep. It has become a tradition that there is a picture taken of every newly elected mayor of the city in front of a currywurst stand or Imbissbude as the Germans call it. Another curious fact about the currywurst and its relation to Berlin is that there is even a museum. Since 2009 this museum invites its visitors to participate and enjoy the experience with all senses. The number of Imbissbuden to partake in a currywurst is very likely to match the number of Dönerbuden and to be honest I am not sure that either one of them can walk away as clear winner in being Berlin’s favorite food. Personally, I like both and aside from the great taste both are fairly affordable. I love Dönerbuden, so I think a visit to Berlin should be top on my list! @Carolyn, I am not so sure about the currydog, but I’ll take a kebab and a beer any day! The Doner Kebab looks enticing. You may call me weird but I want to have that with soda and fries. @Ella, nah…everybody has their own taste, I won’t call it weird!